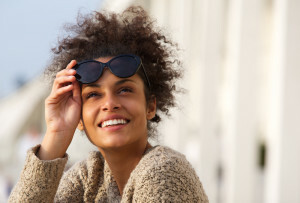 Your smile puts your self-confidence, and self-assuredness on display to the world, but if your teeth are stained from coffee, wine, or tobacco use, or if you have one or several chipped or slightly damaged teeth, your smile may be a source of insecurity instead of strength. Miami’s Dr. Andres de Cardenas and his staff of caring, concerned professionals want you to know that when you walk into our office you aren’t just another patient, you are seen as an individual with your own unique set of concerns and goals. When it comes to the creation of your best smile, Dr. de Cardenas provides you with every option, including our porcelain veneers in Miami. Porcelain laminate veneers are thin pieces of porcelain employed to recreate the natural looking surface of healthy and beautiful teeth, and additionally, provide increased strength and resilience compared to natural enamel. It is the most commonly chosen procedure for individuals seeking to make minor position alterations or to change the size, shape, or color of their teeth. 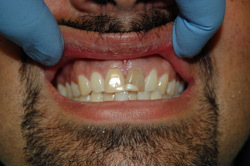 Veneers do not represent an ideal option for situations where patients require a full mouth reconstruction. You can discuss dental implants, as well as other options for a full mouth reconstruction. Porcelain veneers are comprised of several thin ceramic layers that replace the original tooth enamel and are applied through the use of an adhesive. In order to apply a veneer, a small amount of the tooth enamel is removed in order to create room for the porcelain laminate veneers to fit within the mouth. 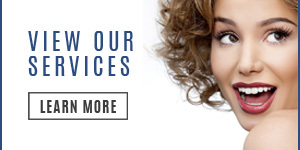 Getting porcelain veneers in Miami from Dr. de Cardenas is ordinarily a relatively simple three-step process beginning with an initial consultation with Dr. Andres de Cardenas in his Miami office. During this consultation, you will talk to him about your goals, and desired outcomes. After a full examination of your teeth and the consultation, it can be determined if porcelain veneers in Miami will help you to achieve your desired goals, and a second appointment will be scheduled. During the second appointment, Dr. de Cardenas will make a mold of your teeth for the construction of the veneers. 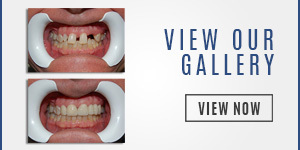 By the third visit, your veneers will be complete, as well as ready for installation. You will be fitted, and the veneers will be bonded. What Are The Benefits Of Porcelain Veneers in Miami? Porcelain veneers in Miami are very successful in circumstances where teeth have developed poor coloring, shape, or contour. It can provide a solution for fractured teeth, teeth gaps, and in many situations where the positioning of teeth has become compromised, creating bite-related problems. Certain patients have trouble where their teeth are generally unresponsive or minimally responsive to tooth whitening, in addition to bleaching procedures. When this happens, porcelain veneers in Miami may be the most viable option for improving their smile. 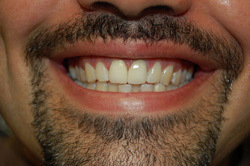 The nature of the composition of veneers being sculpted to the patient’s unique smile makes it nearly impossible to distinguish between a veneer and the original natural teeth. Additionally, veneers are far more resistant to staining and fading from coffee, tea, and tobacco use because of their material composition. Are Porcelain Veneers in Miami Right for Me? If you are still wondering if you represent a good candidate, or if a porcelain veneer procedure is the right choice to help you cultivate a smile that properly reflects your self-confidence, and self-assuredness, Dr. Andres (Andy) de Cardenas invites you to find out more! You can contact us using our convenient email form and we’ll get right back to you, or simply call us at (305) 251.3334. 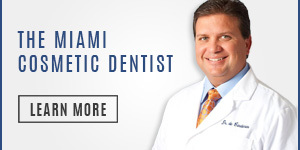 Talk to Dr. Andres (Andy) de Cardenas and discover how porcelain veneers in Miami can give you your best smile. Contact Dr. de Cardenas today and experience the difference between being treated as a patient, and being a treated as a part of the family.